This was undoubtedly a “box-ticking” exercise this event, as I have never really been much of a one for The Gowf. I had enjoyed it a few times on TV over the years certainly; those Ryder Cup tussles on the BBC before Mr Murdoch got his hands on the event plus, most memorably, Nick Faldo’s 1987 Open win at Muirfield. But it had never struck me as much of a “there-on-the-day” spectator sport. 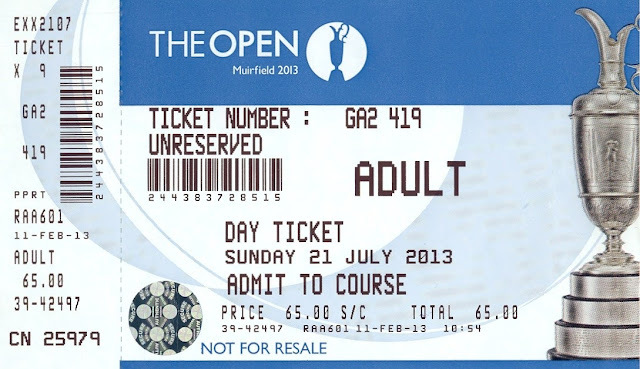 I suppose if one could play the game, I guess seeing the guys in the flesh would be quite a thrill, but whilst I had certainly enjoyed the occasional hapless 9-hole round, I could never really be bothered putting in the practice required to become even remotely competent at the sport. After a preliminary meander around to get our bearings, Son and I settled down in a gallery next to the 16th hole where we learned, much to my chagrin, we had just missed Fred Couples shooting a birdie 2. Never mind, I said to Son, there will be loads more today. 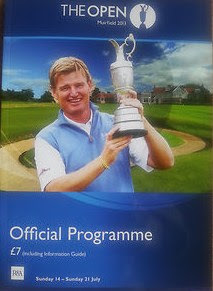 For we had decided to follow last year’s champion Ernie Els around the course. Although he was beginning the last day eight shots behind overnight leader Lee Westwood, we felt he could possibly make some decent inroads into that deficit. Thus did we spend the next half hour or so watching this tall South African thwack a golf ball towards the horizon, and then walk after it before doing more of the same. The attraction of witnessing this process repeated again and again soon faded, and we chose instead to settle down in the 4th hole gallery, from where not only did we get a great view of the green, but could (just) see the players teeing off. Surely some birdies here, or perhaps even a hole-in-one maybe, given it was a 226 yard par 3. But not a bit of it. 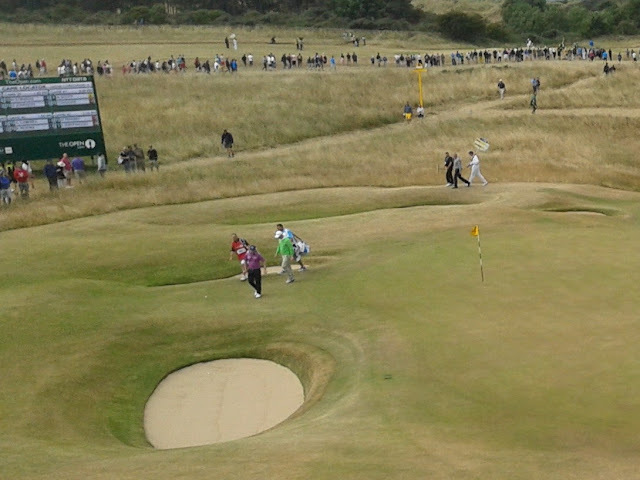 Whilst we certainly saw some close-run things with long putts, and also some Houdini-esque escapes from both the rough and the bunkers, never a birdie did we see. 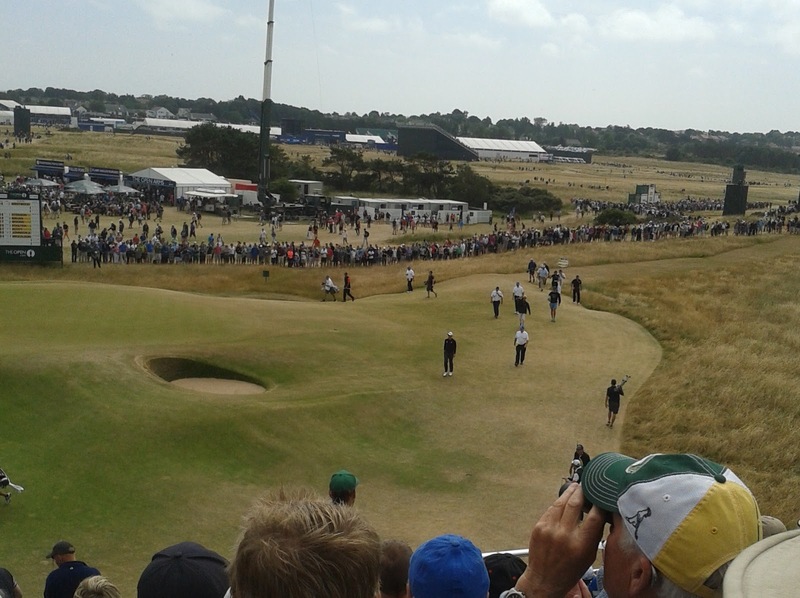 In fact some of the putting from close-in was pitiable, particularly given we stayed to watch twenty of the best golfers in the world having a bash at the hole. Indeed, Welshman Jamie Donaldson took three putts to get the thing in from just a few feet. 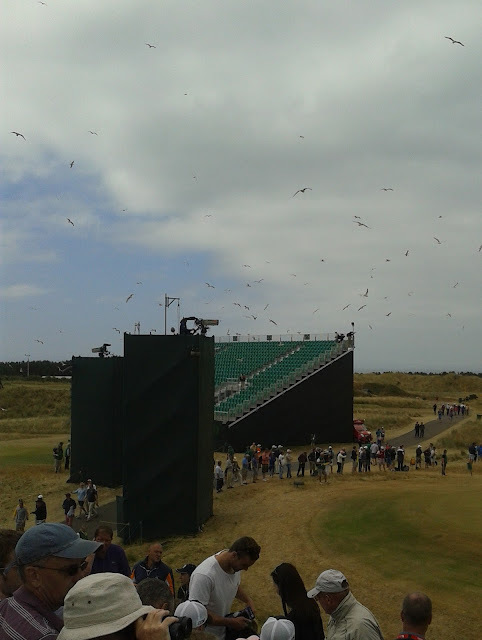 What made things more galling was that the crowd in the adjacent 12th hole gallery seemed to be enjoying a whale of a time if the frequent roars were anything to go by. So it was, after Tiger Woods and Adam Scott both dropped shots at the 4th did we decide to move to this infinitely more promising sounding gallery. But initially we had no luck here either, although we did see Swede Henrik Stennson rescue par with a quite outrageous shot from deep in the undergrowth. And once again, infuriatingly, it appeared that the next door gallery (the 13th this time) were having all the fun, as Hideki Matsuyama and Franscesco Molinari both picked up strokes in quick succession to great aclaim. It was left to Tiger Woods to finally save our day, rolling in a put for a birdie from what looked to my untutored eye a good 30 yards; this being one of the few high points in an otherwise frustrating day for the American. We hung around the 12th for our first view of start-of-day leader Lee Westwood, who had by this point in the day had begun to wobble alarmingly. He saved par here, but hardly convincingly. 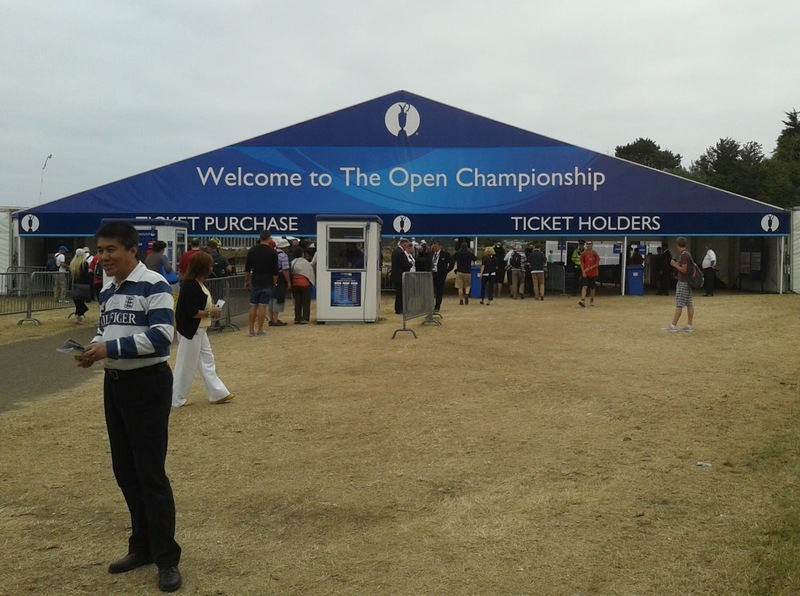 Son and I then set out for the 18th Hole, only to discover we had left things too late in the day to gain access to the public galleries here, both of which were full to the proverbial gunnels, with each boasting a lengthy waiting queue. To join one of the lines of hopelessly optimistic individuals, who could only have been hoping to gain entrance by dint of a number of folks in the stand dying, for I could see no other reason for anyone to leave. 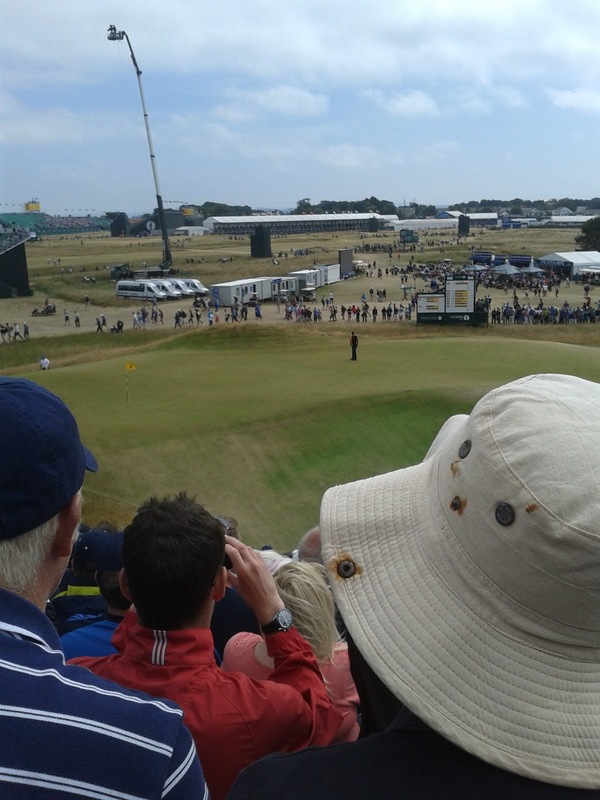 To stand alongside the fairway in front of these stands – although this area was already 3 to 4 bodies deep - from where we may just have been able to glimpse a few square metres of the 18th green. To go and watch the proceedings on a large screen – effectively to watch it on TV, which was hardly what I had forked out my £65 to do. And I did begin to ponder the worthlessness of a venue which could not provide all spectators with a decent view of the final act. I have no answers to the problem, but the situation did feel a bit like having sat through acts I-III of Macbeth, being asked to view the closing scenes of Act IV from an adjacent room through a letterbox. It was all rather unsatisfactory, and I did feel as if I had been diddled somehow. After discussion, Son and I came to the conclusion we had a fourth option; which was just to knock off early and go home. And given this option offered the real probability of missing out on what looked like being an epic wait to get out of the car park, choosing this one was by no means a difficult decision to take. 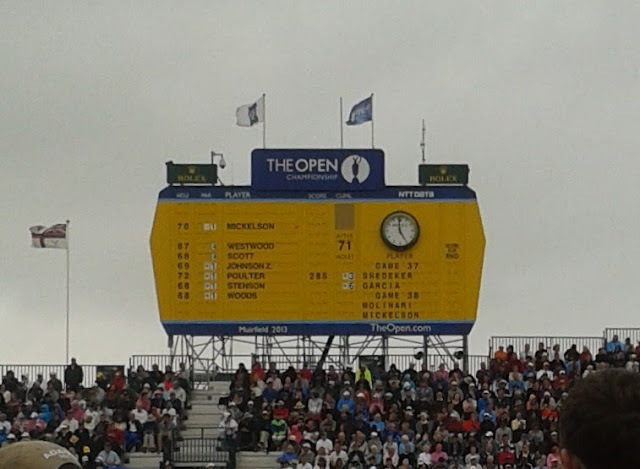 Thus it was, even before the unhappy Mr Westwood had teed off at the 18th hole, we were out of the car-park and well on our way to two whopping ice-creams from Luca's in Musselburgh. 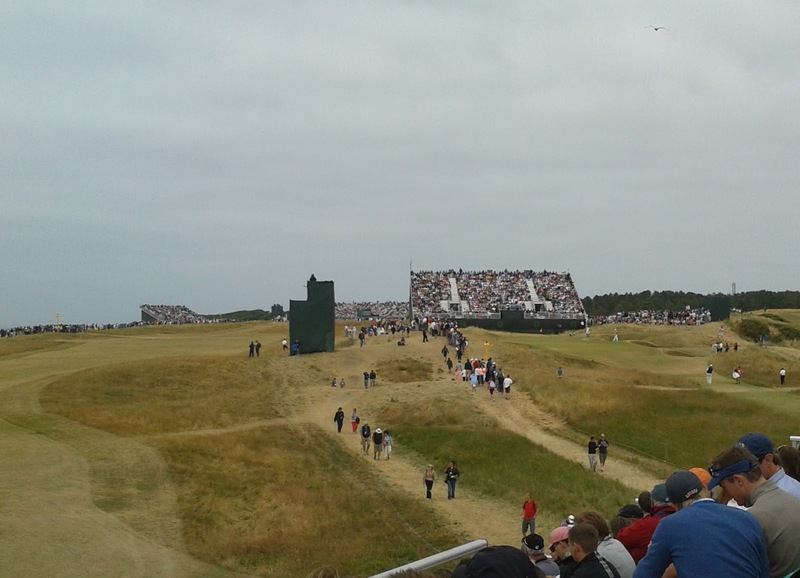 The 1st hole tee-off position at Muirfield. 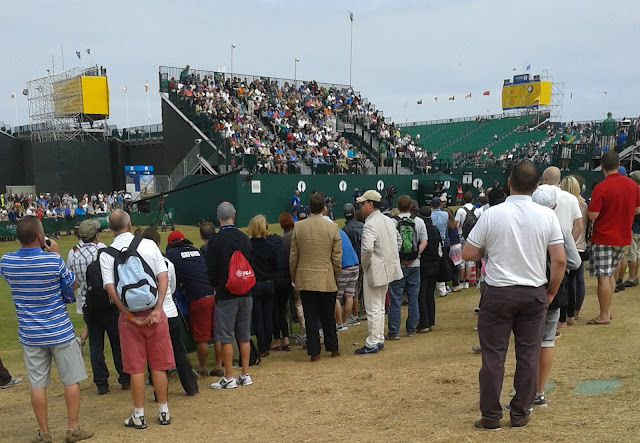 Ernie Els is somewhere in there signing-in. Tiger Woods and Scott Adam go searching for the balls after their tee-shots at the 4th hole. I had to rely on surreptitious snaps taken with my phone. distance the 5th and 11th hole galleries. The famous yellow scoreboard, with Phil Mickelson almost home.